A Facebook user spotted this sign in University City. We think it may be illegal. This morning, a photo was posted to a closed Facebook group showing an illegal parking sign up near 38th and Market on Penn’s Campus. It was, and remains, unknown who put the sign up and why, but the person who posted the photograph also claimed they were told by a security guard not to park their bike there. Remember: You are allowed to park your bike on public street poles and parking meters in Philadelphia, so long as they do not block the pedestrian right-of-way or prevent people in wheelchairs from easily getting past your bike. And given the location of this particular sign, it seems like it would be legal to lock up there. Whoever put this sign up, therefore, likely broke the law. I called the Penn Police this morning, and spoke to three separate people, none of whom were completely familiar with the situation. The final police officer I spoke to said he wasn’t aware of the sign, and I told him that signs posted to street signs were illegal. He said he would have to look into whether the sign were a hazard to people with disabilities, and he said he’d let Penn Police Capital Fischer know of the situation. He also said no bikes parked to the rack would be removed. I will continue reporting on this as necessary. 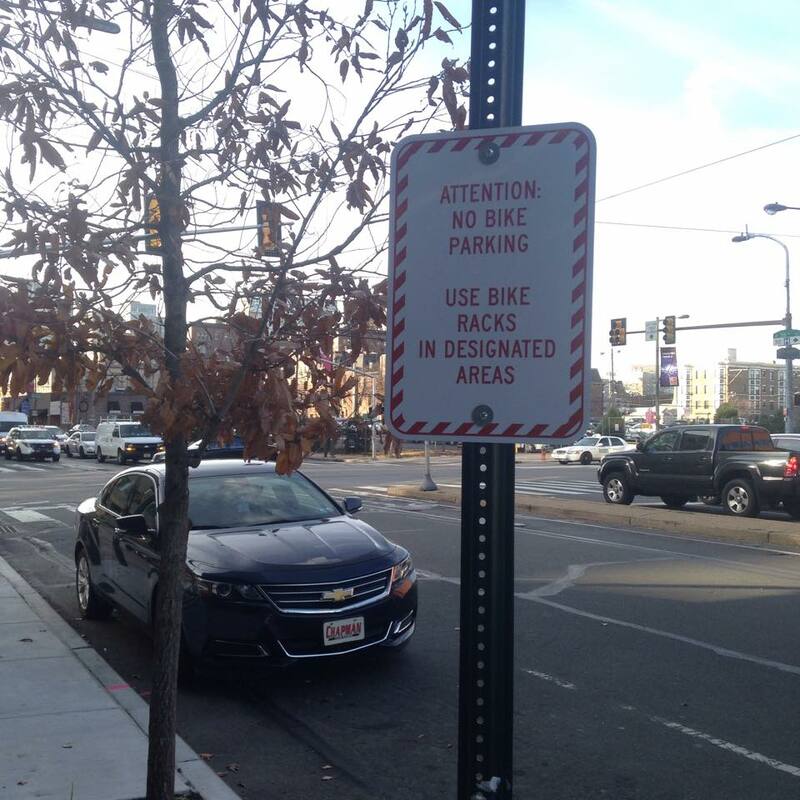 UPDATE: The sign was taken down after Juliana Reyes, of Technically Philly, reported on it. Remember to report all illegal signs to the Philadelphia Police Department. There are 1-2 similar signs on Ellsworth St. between 13th & Broad in South Philly, too.